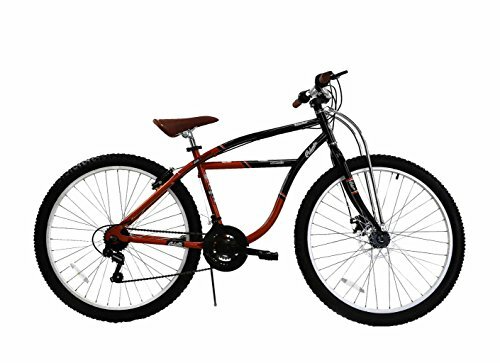 Spratly Brands 27.5 Columbia Klunker Mountain Bike - Black/Red/Brown by Spratly Brands at Melon City Bike Club. MPN: CBA-162701-DG. Hurry! Limited time offer. Offer valid only while supplies last. The Columbia Klunker Bike has a design that calls back to the early days of off road riding, made with modern technology for upgraded performance. The Columbia Klunker Bike has a design that calls back to the early days of off road riding, made with modern technology for upgraded performance. This bike features a sturdy hi-tensile-steel twin tube frame, as well as an uncrown design fork with chrome struts. In addition, it is equipped with a Shimano® REVO twist 21 speed shifter. The Columbia embossed saddle gives you a stamp of quality and comfort. Frame Size: 18" --- Wheel Size: 27.5"
If you have any questions about this product by Spratly Brands, contact us by completing and submitting the form below. If you are looking for a specif part number, please include it with your message.